Previous Research | Gui D. Maia, Ph.D.
Dr. Maia’s research background is in agricultural air quality and environmental control in the context of complex systems. At the University of Kentucky, he investigated the effects of media moisture on ammonia reduction on greenhouse gas generation. As a postdoc, he was involved in two major projects. The first looks at sustainability of intensive farming through the interactions among grazing, crop yield, and greenhouse gas emissions in corn/beef production systems. He led the design and commissioning of an advanced emission measurement apparatus that he called REMS (Ruminant Emission Measurement System), to quantify ruminal greenhouse gases from beef cattle. In his other major project Dr. Maia worked with the ADM Institute for the Prevention of Postharvest Loss on strategic and tactic system-level modeling assessing alternatives to reduce postharvest losses in Brazil and India. He was also looking at expanding the concept of losses to environmental dimensions, including carbon emissions from inefficiencies in grain transportation. Dr. Maia’s PhD research at the University of Kentucky dealt with the evaluation of ammonia mitigation technologies using gas-phase compost biofilters. 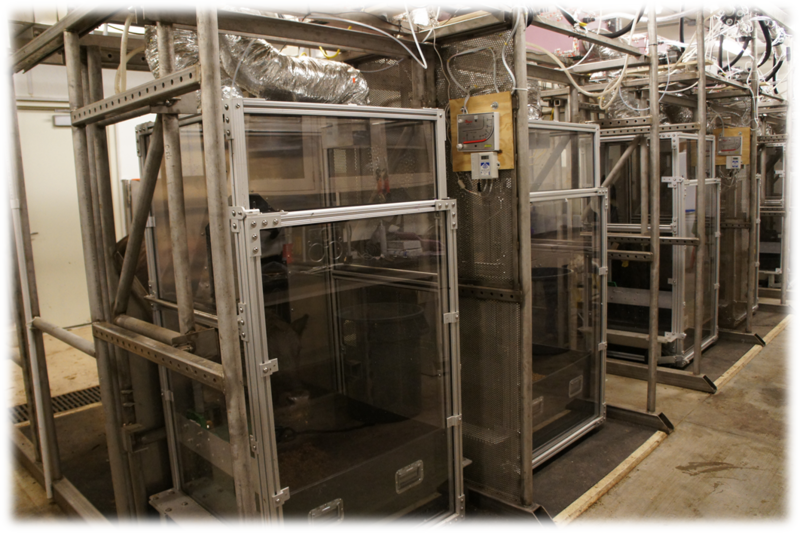 He demonstrated that the benefits of ammonia mitigation was outweighed by the generation of greenhouse gases under specific biofilter moisture conditions, creating new ways to think about how to make biofilters more sustainable. He defined optimal operational moisture ranges for reduced greenhouse gas (GHG) generation and increased ammonia removal. He also developed new methods for physical characterizations of biofilter media by combining media particle physical-chemical properties and moisture content. Two of his publications on this topic were cited in the United Nations 2013 FAO report. Enteric fermentation is second only to natural gas as a leading source of methane emissions in the US (United States Department of State, 2007). Hence, the accurate quantification of this gas is critical for the development of environmental policies on greenhouse gas emissions and mitigation or adaptation strategies. The REMS helps this purpose by supporting research on the relationships between nutrition, genetics, and management strategies with their effects on methane emissions from enteric fermentation. The REMS is a substantial improvement from the called “chamber technique”, which is the method considered the standard to quantify methane generation from beef cattle. 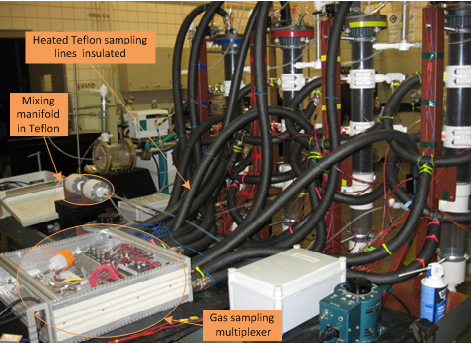 The innovative methods and apparatus developed in the REMS design and commissioning will likely establish new standards for the study of gas emissions using the chamber technique. 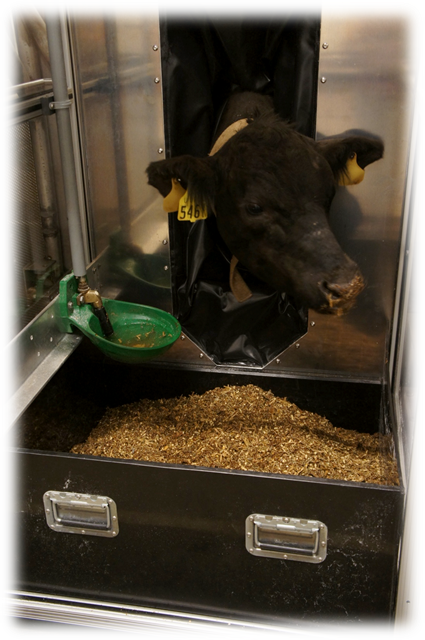 The Ruminant Emission Measurement System (REMS) supports research on the relationships between nutrition, genetics, and different management strategies, and their effects on beef cattle methane emissions. Animal utilizing one of the chambers of the REMS. One of the main challenges of the Twenty-first Century is to feed a population of 9 billion people by 2050. This requires urgent action to ensure a steady food supply, access to food, and food healthy utilization to the growing population. Infrastructural development is critical to reduce food lost in supply chains. Infrastructure in food storage and transportation directly addresses the multi-dimensional aspects of food security. First, infrastructure brings regional development with potential increase in community income, which, in turn, will have more access to the locally produced and imported food. Second, well-designed infrastructure on food storage and transportation enhances food safety, consequently, improving food utilization. Finally, improved infrastructure increases resilience for human adaptation to climate change, therefore, allowing a more stable supply of food. Dr. Maia is researching alternatives for infrastructural expansion in developing countries to reduce grain postharvest losses. 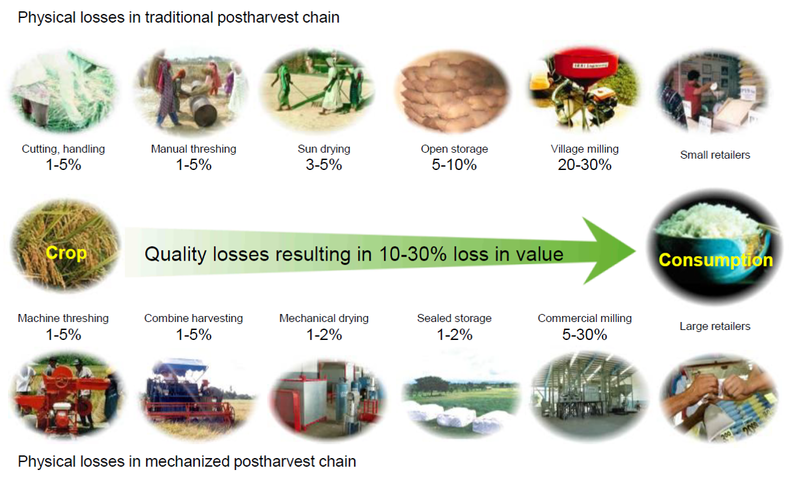 If grain losses are reduced in several stages of the supply chain, more food will be available and accessible for internal consumption and for the external markets. He is currently adapting a GIS-enabled biomass-ethanol optimization model for the Brazilian soybean supply chain. The previous model looked at optimum locations of biomass central storage facilities and biorefineries in the state of Illinois. The Brazilian model will search for locations of new domestic markets and will assess the impacts of onfarm storage on quality and quantity grain losses. He has identified that in the case of Brazil most of the losses occur from lack of suitable storage or pre-processing and poor transportation infrastructure. Major highlights of this model includes a) use of quality and quantity loss coefficients through every stage of the supply chain, b) the impacts of onfarm pre-processing and storage on grain losses, and the c) impacts of new and nearby-farm domestic market processing facilities as an alternative to long-distance grain transportation to export ports.